North East, in Newcastle in particular. stride to provide a breakfast option for everyone. Our Danish pastries option includes a variety of different tastes so there is bound to be something for everyone. These are usually served cold but could be served hot on request. To add more variety you could combine the Danish pastry selection with one of the other options listed below. Whole fruit platter - as a company we offer two fruit platter options, one includes sliced fruit which is usually used as a desert, and the other uses whole fruit, ideal for breakfasts. Not everyone would thank you for fruit on a morning but for previous jobs in the Tyneside area a fruit platter has been a huge success. Combining this with another option such as the Danish pastries described above helps provide variety. Yoghurt selection - not the most popular choice on its own but great when combined with a whole fruit platter. 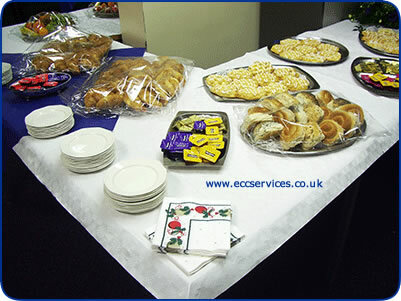 Executive catering cervices select their yoghurts from a local dairy farmer, choosing only the highest quality produce. For the health conscious these are a great alternative to Danish pastries. When previously providing breakfast catering in the Newcastle area, the combination of a yoghurt selection and a whole fruit platter has proved to be a huge success. Bacon and sausage sandwiches - far and away the most popular breakfast option both in Newcastle and other parts of the region are bacon and sausage sandwiches. These are ideal for busy functions or for those who want to eat on the go. Possibly not as healthy as fruit and yoghurt but all the same another great breakfast option provided by the company. Tea and coffee - facilities to make tea and coffee are a must for any breakfast function, for some these facilities are more of a necessity than the food. Our tea and coffee breakfast option comes on a self service basis. As a company we provide all of the equipment, including the water, and then those who wish to use the facility can so throughout the day. This option is popular all over the region not just Newcastle and is perfect to combine with any of the above breakfast selections. If you require a breakfast catering option please take a look at our breakfast menus or give us a call. Below are some photos from a early morning breakfast meeting we provided in Newcastle Upon Tyne.